When I visited Kantaroli village in Premnagar Block a few months ago it was difficult to put my finger on the reason for my unease. One comes across many perennial and seasonal streams in the forest and most homes have wells which water their vegetable crops; the agricultural fields promise good yields and blend into the background of darker green. The forests around the village are lush and predominantly sal and a botanist’s delight. The several rare epiphytic orchids, the unusual species of Smilax, the known presence of elephant and tiger, and the overall condition of the forest makes it worthy of being marked as a Biosphere Reserve. Only after a couple of days did I become conscious of the gloom that hung over the village, of the almost matter-of-fact greetings I received from people who crossed my path, and of a quiet desperation that lay just below the surface. It took awhile and many close meetings with the people to realize that this was the result of the more than 7 years of bearing the brunt of the state–and the various institutions established for their welfare–as they resisted its efforts to mine the coal beneath their lands and forests. The population census of 2000 of Premnagar village records 61% of Scheduled Tribes; in the 15 wards of Premnagar Block, 7 are predominantly of tribal people (including Primitive Tribal Groups), with the figures showing 100%, 93%, 87%, 83%, 79%, 76% and 76% for the wards. The youth of the village, as modern and as full of dreams as any of their age in rural India, discussed their predicament when they met. They asked me where they will go if they are evicted despite their resistance; some families have lost hope and do not invest in their agriculture. I was told that there have been many occasions when the worry and the fear about their future had made the people lose their appetite! There were times when the chula remained cold. In January 2006, Chief Minister Raman Singh addressed a gathering in Premnagar village in Surguja District, Chhattisgarh. He was very concerned that districts like Surguja and Bastar remained a blot on the map of Chhattisgarh with their “backwardness”. He asked the people “If circumstances have put coal in the lands why should they not produce power? Why should power be produced 1000 kms away? The coal is ours, the earth is ours, and the water is ours, why should somebody else produce the power?” He spoke at length, inviting the people gathered to imagine how Premnagar can be in 10 years if they followed the path he indicated. Like Korba and Bhilai, Premnagar will be a large city; with hospitals and colleges; land prices will shoot up and what is now worth Rs 50000 will be worth 10 lakhs; there are 1100 factories in Bhilai as it produces power! And then, towards the end, taking a jab at those who resisted giving up their lands, the punch line: Yahan kharkhana nahin khulega tho kya tumhare ghar mein khulega? If the plant can’t be put up here should it be put up in your homes? He was referring to the proposed thermal power plant, to be set up in Premnagar at an estimated Rs 4000 crores. Chhattisgarh has been projected as the “power-hub” of India and on 4th June 2005, at a meeting in Raipur between the Chhattisgarh government and IFFCO (Indian Farmers Fertilisers Cooperative Limited) it was decided to take over the coal deposits in three Coal Blocks in the Hasdeo-Arand forest area of the district. It was only on the 5th June that the newspapers and TV reports brought the news of the decision to the people who would be most affected and probably thrown off their lands. In the excitement of the deal between the state and the world’s largest cooperative federation that was to generate 1320 MW, both parties overlooked the fact that most of these areas of Surguja were Schedule V Areas, where the Panchayat Extension for Scheduled Areas Act, 1996 (PESA) was in force. The PESA, and its provision of the Gram Sabha, was specially enacted to prevent just the kind of injustice that was to follow. One can feel the Chief Minister’s urgency of intention. Surely, he wants the people of his state to do well, to access the best education and medical care, to drive about in the latest SUVs, and if all it takes is to let a few companies dig up what is under their feet, why not? The Chhattisgarh Minerals Development Corporation (CMDC) is a firm established in 1975 with major markets in the Indian subcontinent. The Indian Farmers Fertilizers Cooperative Limited (IFFCO) is the world’s largest cooperative federation based in India. About 70% of the fertilizers consumed in India is distributed by IFFCO. It has forayed in many other fields since 1967 when it was registered: one of these is the power sector and linked with the Chhattisgarh State Electricity Board, now known as the IFFCO Chhattisgarh Power Limited (ICPL). In April 2008 a joint venture between the CMDC and the IPCL was forged, which is the CMDC ICPL Coal Limited (CICL). This was essentially to develop the Tara Central Coal Block in the Hasdeo-Arand Coal Field in Chhattisgarh; this would supply coal to the 1320 MW proposed power plant at Salka village in Prem Nagar Block. Premnagar Tehsil being a predominantly tribal area was administered by the provisions of the PESA, and had quite clearly rejected the proposal of the power plant in several of its Gram Sabha meetings. The President of Premnagar Panchayat was Ghasiram, an elder respected for his outspokenness and honesty, opposed any takeover of their lands by IFFCO and has been the backbone of the struggle against the plant. Margdarshak Sewa Sansthan, a peoples’ NGO that functioned from Kantaroli, one of the villages that would be affected, was instrumental in helping the struggle become a movement. Requires that the State Governments change their existing laws wherever these are inconsistent with the central legislation. In particular, the National Tribal Policy (point 6), states that “Alienation of tribal land is the single most important cause of pauperization of tribals, rendering their vulnerable economic situation even more precarious. Of even greater concern is the fact that the lands lost are usually the most productive,......” The Forest Appraisal Committee (FAC) that was later appointed to scrutinize the various proposals for diversion of land also found that the people to be affected were not adequately aware of the R and R policy/measures; nor were the procedures of the Tribal Forest Rights Act for Scheduled Tribes and Other Forest Dwellers Act (the FRA, 2006), completed! In tandem with the PESA Act, the rather recent and overdue FRA 2006, was specially enacted to correct an “historical injustice” perpetrated on our tribal peoples since before independence. Having no legal entitlements to the lands they cultivated or inhabited, the tribal people have been regularly displaced–in many cases more than once in a single generation, and in some cases even thrice–to make way for whatever is termed a “national” interest, without receiving any compensation or often even a minimal consideration. The FRA was to give the tribal people rights over their lands, to assure them the ownership of Minor Forest Produce, and to prevent further alienation. A proper implementation of the PESA and the FRA has been thought of as a way out of the current unrest in many parts of central India–particularly in Chhattisgarh, Jharkhand and Madhya Pradesh–as they would address the most urgent concerns of our forest dwelling populations. Yet, as the people of Premnagar resisted the takeover of their lands by IFFCO, the Chief Minister himself came over to convince them that they were making a wrong choice! What were they to do? Seen through its eyes, its mission has nothing to do with transforming the nation; it consists, prosaically, of being the transmission line between the nation and a capitalism, rampant though camouflaged, which today puts on the masque of neo-colonialism. The power plant meant many things. The allotment of Tara Coal Block to IFFCO; the allotment of the Parsa East and Kente Basan Coal Blocks to the Rajasthan State which then contracts the Adani Group to mine the coal (the principal fuel, though the Environmental Impact Assessment mentions only the Tara Coal Block as its principal source of fuel)2; the damming of the Atem river that flows through the region and is a tributary of the Hasdeo; and the construction of the power plant in Premnagar and later, when this was successfully opposed, in Salka village. IFFCO, a farmers’ cooperative, was asking that farmers leave their lands and move elsewhere! The land required for the project site was 728.41 ha spread over 5 revenue villages (Premnagar, Chandanagar, Namna, Raghunathpur and Abhaypur) and would affect 1386 families. An additional 2301.260 ha (in Tara Coal Block) and 1898.328 ha (in Parsa East and Kente Nasan Coal Block) of forest lands were proposed for diversion by the M/s Chhattisgarh Mineral Development Corporation and M/s Rajasthan Rajya Vidyut Utpadan Nigam Limited (RRVUNL) for open cast coal mining. The fresh water required for the power plant is 3650 cu m per hour; the source is the Atem river as well as the confluence point of the Atem and the Gej river. The amount of water, if calculated at the national recommended amount of 135 litres per capita a day, would take care of the requirements of half the urban metropolitan population of Naya Raipur; if we go by the available amount of 40 litres per capita in rural areas, it is sufficient to take care of twice the present population of Raipur!! Ash Pond scenarios near Angul, Orissa, from a NALCO thermal plant; more area is sought by the Plant to make way for the ash and, agriculture in the vicinity is affected as also the health of the people and animals. Plastic sacks filled with ash holding down a sheet covering a river of ash (above); the plant in the distance and the “ash pond” (below). The amount of bottom ash that will be generated is 1600 TPD (tons per day); the fly ash will be 6400 TPD. The waste water generated to handle the ash will be 30 cu m per hour. This is an impending disaster as the disposal of ash generated has been a major problem in all such projects. In the NALCO project mentioned above, the continuous generation of ash has affected all the villages in the periphery of the plant, spilling into the rice fields, polluting sources of drinking water, with no practical solution in sight. NALCO has bought some of the affected lands and intends to buy more with a view to accumulating the ash! Since 2004, up to 13 petitions had been sent by the people to the Governor3 through the Collector and the Tahsildar explaining why they did not want the power plant in their area; only in 2008, when some of the Gram Sabha members personally went to meet the Governor, Mr E. S.L Narasiman, did they realize that none of the earlier petitions had reached his office! During these years there were up to than a dozen attempts by the Collector and the administration to pressurize the Gram Sabhas of the affected villages to agree to the setting up of the power plant. In 2006-07, Namna village, under much political pressure, consented; in 2008 Raghunathpur, a village with a mixed population, gave its succumbed. In the Gram Sabha meetings held after Narasiman’s intervention the Collector was present to oversee the village meetings; apart from Namna and Raghunathpur all other villages refused to entertain the idea of the power plant. On 19 January 2009 the Navbharath Times reported that the government had retreated from Prem Nagar and was planning to go to Salka, Murgaon and Narayanpur, some kilometres east of the earlier site. Local sources narrate how Salka, where there would be a power plant, was besieged by officials and the police for 3 days before the Gram Sabha was conducted; no news persons or outsiders were able to enter the village and the agenda for discussion was set by IFFCO. Around this time several political parties too joined in the opposition of the plant and in these new areas and intervention by MSS was less than before. Salkha village: removal of topsoil, the first step in coal mining. The people from Salka have accepted compensation for their lands. Most villages near Salka are surrounded by good sal forests and are blessed with large mango, tamarind and mahua trees, all obvious signs of wealth and antiquity. On an early morning visit to Salka I came across the sad sight of fallow fields–there is no more interest in investing time and energy in agriculture - and groups of drunken youth among their parked motorcycles. They spoke casually about “crores and Boleros” and some of the boys were so far gone that they could barely articulate their words; all of them hoped to secure a watchman’s job in these work-sites. Apparently a part of the “compensation” money, already paid by late 2009 in Narainpur and Murgaon, may be responsible for the dilution of opposition to the project. Out of the blue, in March 2010, the Premnagar’s Gram Panchayat was notified as a Nagar Panchayat or City Council. The people of Premnagar were no longer villagers! This entailed that the “wide, special and significant powers of the Gram Sabha to which they belong, which are spelled out in the PESA Act4” , no longer applied to them. Though such a change of status cannot legally happen without the consent of the Gram Sabha the notification had come and there was nothing to do but appeal against such action5. When the village people objected to their Gram Panchayat being converted to a Nagar Panchayat the Additional Collector stated that the notification of change had been published in Chhattisgarh Rajpatra (Gazette) on 30 July 2009; any objections were to have been raised within a month from that date. It is not difficult to link the fact that the people of Premnagar Tehsil, in the special Gram Sabha Parishad created for the purpose, opposed the establishment of the power plant and the coal mining in their region6. The Chief Minister visited Ambikapur on 8 July 2009 and during the “Janadarshan” programme at the Guest House announced that the Gram Panchayat Premnagar will be changed to Nagar Panchayat, as a “gift” to the people of Premnagar! This declaration–which in itself is totally unconstitutional–was published in the local newspapers and was the first intimation to the concerned villagers about their changed status which would leave them without the protection of the Gram Sabha. That the move was directly related to the Gram Sabha’s opposition to the power plant was anybody’s guess. Clockwise from top: fallow fields, guys with new bikes, and lands forsaken! In Chhattisgarh a total of 67 Gram Panchayats have thus been converted into Nagar Panchayats. Some of them have been lumped together with neighbouring Panchayats–in order to comply with the norms of the Nagar Panchayat, such as a minimal population of 5500–which has affected about 150 Gram Panchayats in about 300 villages, almost all of them in PESA areas! Dentistry turned to a diplomatic skill promises us a Golden Age tomorrow. The going’s rough, so we need the laugh of bright incisors and molars of goodwill. Our times are still not sane and safe enough For faces to show ordinary sorrow. On 23rd June 2011, Jairam Ramesh, the Minister for Environment and Forests, agreed7 to grant Stage-I approval to the proposal of the Chhattisgarh State to open up 3 coal blocks (Tara, Parsa East and Kante Basen) in Surguja District. The coal blocks lie in the northern part of the Hasdeo-Arand region. (a)He stated that the coal blocks are located in the fringe area of the Hasdeo-Arand forest and not in the biodiversity-rich area. This was in the proposal all along! In addition, the FAC also found valid signs of the presence of Schedule-I mammals in the region, especially of elephants. The NCTA’s 2011 report indicates tiger presence in the Hasdeo-Arand region in 2004 and there are several encounters with elephant. In fact, the Lemru Elephant Reserve is in the Haseo-Arand forest area which, overall has an 80% forest cover and is “one of the largest intact forest blocks in central India outside the Protected Area system8”.This block of about 450 sq kms–with no human habitations within–was approved by the MoEF as an Elephant Reserve in 2007. A Central government inspection team also noted the dense forest habitat suitable for elephant, noting also that the only threat to the area was “in terms of its mineral importance of coal9”. (b)He stated that changes have been introduced in the mining plans to lessen the damage. One of the changes was to transplant about 70,000 trees, an almost unworkable proposition except when done in urban settings for a very limited number of trees. The FAC categorically ruled out the feasibility of such a scheme. The area of forest to be diverted was also reduced but the amount of coal to be extracted showed no change! (c)Apparently the concerns raised about wildlife (the presence of large mammals in the region) can be “taken care of through a well-prepared and well-executed wildlife management plan and programme”. These are serious concerns and any more fragmentation of the forests cannot be repaired by engaging new organizations. The presence of large mammals has been deliberately underplayed by all the EIA’s, by the NTCA reports, etc. ; also, for conservation of large mammals we need to look at the cumulative effects of projects over a continuous zone as these are migratory corridors10. Since 2008, “industry pressure” has made the state first reduce the area to be protected as an Elephant Reserve and gradually open up the entire area for coal. The NCTA 201111 report shows no tiger, leopard or elephant presence in the area from 2005 onwards: could this be a ploy to make the EIAs–conducted by a laboratory12 specialized in “pharmacovigilance”–look credible? Fragmentation of forests due to mining will break the habitual corridors of passage of animals. All over the country this has led to an increase in man-animal conflicts, including deaths due to elephants entering habitations within the Hasdeo-Arand forest area. (d)Apparently these coal blocks are related to supercritical thermal power generating stations; this is an “explicit precondition for approval”; furthermore, such supercritical technology is necessary to “meet our growing energy needs in an environmentally friendly manner”. The supercritical project is expected to meet its coal requirements from other coal blocks in Hasdeo-Arand for which a number of companies have shown interest (Tata Power, Jindal Steel, Essar, L&T, GVK Power and Sterlite Industries are some of them). In February 2012 the Chhattisgarh government proposed a railway line to connect the various coal blocks in Hasdeo-Arand forest area despite the granting of only the conditional Stage-I approval of the MoEF. Furthermore, this aspect was known from the beginning and not a new development. Ironically, Ramesh suggests that the Chhattisgarh government be rewarded–for (possible) restrictions on further mining in the Hasdeo-Arand forests–by granting them a “green bonus” from the central government. (e)Apparently both the state governments, of Rajasthan and Chhattisgarh, have been persistently following up their proposals13 as their plans for power generation is linked to the coal blocks. Giving his approval, Mr. Ramesh noted that the Rajasthan Chief Minister Ashok Gehlot had persistently lobbied for clearance for Parsa East and Kente Basan as the coal was needed for a State-owned project14”. Raman Singh, in his letter addressed to the Prime Minister, assures him that “This will fulfil the cherished dream of the farmers of this country to set up their own Power Plant as they along with the State government have already put in substantial money and efforts15”. Mr Jitendra Singh from Rajasthan pursues the case for RRVUNL repeatedly with “I would, therefore, request you to kindly issue suitable directions to the concerned for approval of diversion of forest land and to grant Forest Clearance for mining of coal from “Parsa East and Kanta Basan” coal blocks16”. Does persistence improve ground reality? (f)Finally, Ramesh states that the imperative to sustain the momentum generated by the XIth Plan (as compared to the Xth Plan) in terms of capacity addition. Apart from this, the other explicit reason cited by Ramesh “for allowing mining in these blocks is that these are located in the fringe and not in the bio-diversity rich Hasdeo-Arand forest area......... which has been classified as a no go area for mining17.” He also states that the FAC can work on forest-related issues with single-minded focus but he, as a Minister, “has to balance and keep the broader developmental picture in mind and balance out different objectives and considerations”. This seems quite reasonable if this was not the Minister of Environment and Forests, and the area in question not a Schedule V zone. While granting approval, the Minister reiterates that “more opening of coal blocks in the Hasdeo-Arand forest area will severely disturb the fragile ecosystem of the region”. We are also assured that the Stage-II approval will only be granted after all the requirements of the Forest Rights Act 2006, has been complied with. In fact, the FRA has not been complied with; new areas and railway lines for connecting and transporting away the coal are already on the pipeline; even the rules of the PESA are not adhered to18! Margdarshak Sewa Santhan (MSS) is a community-based NGO which now operates from Kantaroli village. From the early ‘90s MSS has been helping the local adivasi people get loans through the banks–the loans were being siphoned off by a nexus of businessmen, bank officials and the Block administration–as well as in dealing with atrocities by the nakadars and patwaris. In 1997 the Forest Department marked 78,000 trees for felling operations: the goal of the Department was to convert the sal into money. MSS decided to help the people resist the destruction of the forest by the Department in whose hands its protection is trusted. They organised a Chipko-style of protest and people hugged the trees and prevented their being felled. Even earlier MSS had been helping the people. The message about forest protection spread to about 100 villages and 30 youth were chosen as leaders to safeguard community interests. In 2007, the Forest Department descended again in Premnagar Block and began clearing the sal forests between Sahli and Janardhanpur villages, this time to make space for setting up the IFFCO power plant. The felling was stopped by the people only after 500 live trees had been cut down. When the Chief Conservator of Forests arrived he commented that there had been a mistake as he had given permission only to fell dead trees! The people of Janardhanpur and Sahli had a meeting in which they recalled that during the droughts of 1955-56 and 1967-68 their elders had survived because of what they could procure from the forests. The trees were considered as members of their family and those that had been felled were to be mourned: they performed the 13th day after-death ceremony according to Hindu rites and shaved their heads. This dramatic move of about 1000 local people going about with tonsured heads brought in media attention and stopped further destruction of the forests. There are 31 villages that would be affected by the power plant and MSS held several meetings and invited the media to spread the word. By September 2004 they found that more than 86% of the people did not favour the establishment of the plant or the developments that would precede it. A meeting was held in Kantaroli to plan a course of action; they decided to use the PESA Act and the various Conservation laws and began their work in Chandanagar and Abhaypur, close to the site of the plant. Meetings and padyatras were held in many of the surrounding villages to discuss forest conservation, the availability of water, the PESA and, after 2006, the FRA. For it’s plain Man doesn’t realize that even having has its measure; There’s a point beyond which nothing can increase our real pleasure. And this is what has by degrees dragged Life so far from shore, And stirred up from the very depths the tidal waves of War. Lucretius, Book V, The Nature of Things. Surguja has regularly come into the news for several other reasons such as famines, its elephant populations and dense sal forests and, more recently, Maoism. It suffers a drought every 5-10 years, the last severe one being in 2001-02, but the wealth of available wild foods19 and the adivasi knowledge about them have prevented migrations. In the 1992 drought about 200 people reportedly died as there was a shortage of even the wild foods usually available. Legal instruments for good governance and protection of the tribal people in India are provided in the PESA Act, 1996, and more recently through the Forest Rights Act, 2006. Our Constitution has also demarcated Schedule V and VI Areas with predominantly tribal populations to ensure that the people cannot be alienated from their lands and resources. The PESA Act “is meant to enable tribal society to assume control over their own destiny to preserve and conserve their traditional rights over natural resources20”. This Lakshman Rekha that the state provides the tribal people for their protection has repeatedly been erased by the state itself, in partnership (and coercion) by the Industry. In the case of Premnagar in Surguja, the modus operandi has been to change the status of the area so that the PESA Act is no longer applicable there and the people deprived of their Gram Sabha! If the Gram Sabha is the obstacle the best way forward to is do away with it. In January 2006, when the peoples’ resistance to the power plant became clear and strong the Chief Minister visited Premnagar and spoke in favour of the plant, the employment opportunities it would bring, and asked the by now famous question Kya plant yahan nahin lagega to kya tumare ghar mein lagega? Many people who were resisting the plant–local farmers, activists, environmentalists–felt demoralized as the leader of the state was himself so unwilling to listen to his people; not only that, he was openly promoting the industry. “In the early years of the struggle (2004-06) one felt strong while fighting against a corrupt administration”, said Mehendi Lal of Margdarshak Sewa Sansthan. “But as the focus of the media shifted towards the State and the Industry we began to feel small and threatened; there is a real fear of physical violence and the media has also been avoiding the issue”. For the people of Kantaroli, the threat of being pushed off their lands with empty promises is real. Many of them have relatives in Chotiya, a village in the Chotiya Coal Block, which was mined out by Prakash Industries Limited. A CBI investigation now reveals that Prakash Industries21–in connivance with officials from the Coal and Steel ministries and forged and fabricated documents - have been allotted coal blocks in Madhya Pradesh and Chhattisgarh; nearly 50% of the mined coal has been diverted into the black market! Whatever the legal procedures that will follow, the people of Chotiya and several villages in the region have lost everything. The National Tribal Policy predicts that “The net result of such tribal neglect has been that the Scheduled/Tribal Areas have become happy hunting grounds for insurgent groups who play upon the dissatisfaction and anger of the exploited tribals”. More recently the Supreme Court has also observed that the neglect of the laws pertaining to the Scheduled Areas is a prime cause for naxalism and unrest in the tribal areas22. Now with the revelation of the Coalgate scam and the irregular allocations of coal blocks in various states of central India–and the ongoing insurgency in tribal areas–it is imperative that one takes a fresh look at how the PESA Act is being undermined by both the State and the Industry. It is not a coincidence that over 60% of the forest-cover in India is in 187 tribal districts23, making evident the role of tribal of people in forest conservation. The urban agenda of development, couched as it is in an unending supply of energy, need to be revisited and questioned for its practicality. Are the forests and the natural wealth of any place to be viewed only as a means to an end? As a way to forge ahead rather than pause and reflect–honestly and holistically–what those forests are to the people and non-people who live there? Can we accept that the adivasi people living in these forest-villages are competent enough to manage their own affairs, that they are able to decide–if told the truth about an intervention that is bound to irretrievably alter their landscape–whether they welcome it or not? Are the Acts such as the PESA and the FRA just to show the world that the Indian government cares for its tribal people while on the ground it gets worse than before? Or are we necessarily bound to the view that all natural wealth is nothing else but a means to an end, and that nothing, neither law nor basic decency, will come in the way of this vision? From the unfolding of the events in Surguja and the collusion of various powers that vie for the control of the country’s coal and energy, it seems probable that we are driven on the latter path. But perhaps the people of Premnagar may well surprise us, and show us a new way of resistance, and convince the state and us that forests and streams are actually ends in themselves and that the coal beneath their feet might just as well remain there. IMTA Labs, Hyderabad, is a organization specialized in conducting Contract Research and Testing and provides “pharmacovigilance” services which has also branched out into newer pastures such as Environmental Impact Assessment (EIA). VIMTA Labs took up the bid on the invitation of IFFCO Chhattisgarh to conduct the Rapid Environmental Impact Assessment (REIA) for what was called the Surguja Power Plant. This was in July 2007, when matters in the proposed area were tense with peoples’ protests, gram sabha meetings, etc., but the invitation said, “At present, the land acquisition process is under way”, with no hint of what was happening on the ground. The REIA conducted by VIMTA Labs, in its report, under Anticipated Environmental Impacts declares that the “..... impacts during the construction and operation phases of the proposed project have been assessed and adequate management plan has been evolved to mitigate the impacts.” There is nothing more on what these impacts are or what the management plan proposes to mitigate them. Quite ironically, the topographical map used for the REIA labels the forests near Prem Nagar, Janardhanpur and Chandan Nagar as “Dense Mixed Jungle”; the plant and the proposed Ash Pond are to be located plonk in the middle of this! Despite the region being an area of very rich biodiversity the REIA survey admits to only 327 plant species, leaving out entire plant families such as Orchidaceae, Liliaceae, Disocoreaceae, Commelinaceae, the vast numbers of non-flowering plants, to name just a few. 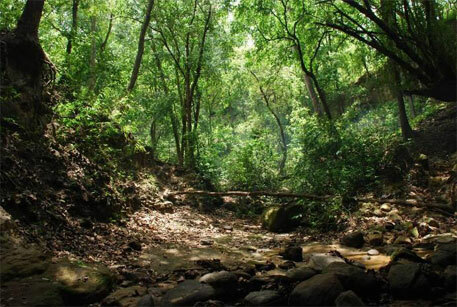 Only 5 species of butterflies, 52 species of birds and 16 species of mammals, and no fish have been listed from this dense forest area; the REIA further states that “.... construction activities will result in loss of vegetation cover (grasses and shrubs) and topsoil to some extent in the plant area. In Chandanagar the people first came to know about the IFFCO project through the local patwari who accompanied the officials who came one day to survey the land! The people stopped the survey and learnt more about the project and were offered Rs 40,000 an acre at first, later Rs 60,000 and Rs 80,000 an acre! The IFFCO officials were invited to the Gram Sabha to explain the project and to seek the peoples consent; the Collector too started attending these meetings to convince the people but they remained steadfast against the power plant. In 2005-06 a Sangatan was established by the people while simultaneously the Company began trying to bribe some of the leaders in their attempt to break the unity of the village. The survey for land continued without the permission of the Gram Sabha. Despite police presence and pressure the 4 Gram Sabha meetings failed to make the people agree to the setting up of the plant; about 45 people then visited the Chief Minister to unsuccessfully petition him against the project. 4. Petition filed by the declaration in the High Court, Bilaspur, by Jugga Devi et al. 5. The appeal of the people against Premnagar being declared a Nagar Panchayat is pending at the Bilaspur High Court for almost 2 years now. 11. Though tiger populations may be low in the Hasdeo-Arand forest, its link to the Achanakmarh forest makes it an important “spill-over” region. There are several signs of elephant presence in the forests around Kantaroli, Maheshpur, Salhi, Janardhanpur and Abhaypur; even during a visit to the area in July-August 2012, a group of Pando adivasis were engaged in driving an elephant herd away from the vicinity of their village into the forest. 13. The FAC considered the revised proposals of both the M/s Chhattisgarh Mineral Development Corporation for diversion of 1324.380 ha of forest land (originally proposed 2301.260 ha) for open cast coal mining at Tara coal block of Hasdeo-Arand Coalfield, and that of M/s Rajasthan Rajya Vidyut Utpadan Nigam Limited (RRVUNL) to divert of 1898.328 ha of forest land for Parsa East and Kente Basan captive coal block open cast mining project in South Surguja Forest Division and rejected them in 2009. These revisions were supposedly to lessen the damages in terms of area of forest destroyed, the numbers of trees felled, etc., but they were found to be still large. The FAC had also categorically ruled out the feasibility of transplanting 70,112 trees that were in the mining zone and which the project proponents proposed in their revised proposal. 18. Tara Block is to be operated by CMDC to feed a thermal power plant (1320 MW) to be established in Premnagar; Parsa East and Kete Besan Blocks to be operated by Parsa-Kante Collieries, a joint venture (74%-26%) owned by Adani Enterprises Limited and RRVUNL. Parsa and Kete Besan blocks have been given Stage-II clearance which has been challenged by the National Green Tribunal as the conditions given for Stage-I clearance have not been met. The top soil removal had already begun in Parsa in August 2012! 19. One of the foods used during drought is yam. At least 9-10 species of yams are found in the forests of Surguja, none of which are mentioned in the vegetative lists produced in the EIA. 23. Forest Survey of India, 2003.